How Much Does it Cost to Start a Motor? You may have heard that when motors start across-the-line, there is a large inrush of current. A common misconception is that because of this inrush of current, starting a large motor is costly and it contributes to your facility’s peak demand charge. This article explains why motor start-up may not be as costly (electricity-wise) as you once thought. Electricity Charge – a charge per kWh. In Oregon, this can range from about 4.5 cents per kWh up to 7.5 cents per kWh for industrial customers. Often there is a separate rate for peak hours and a cheaper rate for off-peak hours. This is the single largest charge on your electricity bill. Peak Demand Charge – a charge per “peak” kW. In Oregon, the utility finds the 15-minute or 30-minute window of time with the highest power usage during peak hours. The power is averaged over this window, and that average constitutes your peak power. In Oregon, this is typically from $3 per kW up to $9 per kW for industrial customers. If you read the definition of the peak demand charge carefully, you have a hint as to one of the reasons why motor start-ups don’t typically contribute to the facility’s peak demand charge. That is, your facility’s peak power is an average of power over a 15- or 30- minute window. Motor start-ups cause a spike in power, but only for a few seconds. Those few seconds averaged over 15 or 30 minutes tend to smooth out the power spike. You would have to start up a lot of motors in the span of 15 minutes in order to make a significant effect on your peak demand charge. A wood products facility uses an 800 hp motor directly coupled to a 6-knife 360 RPM chipper. The motor is started up across-the-line each morning. The customer was very interested in reducing peak demand, and they wanted to know if a soft start would reduce their utility peak demand charge. The inrush current (Amps) is high, at 1,500 Amps. 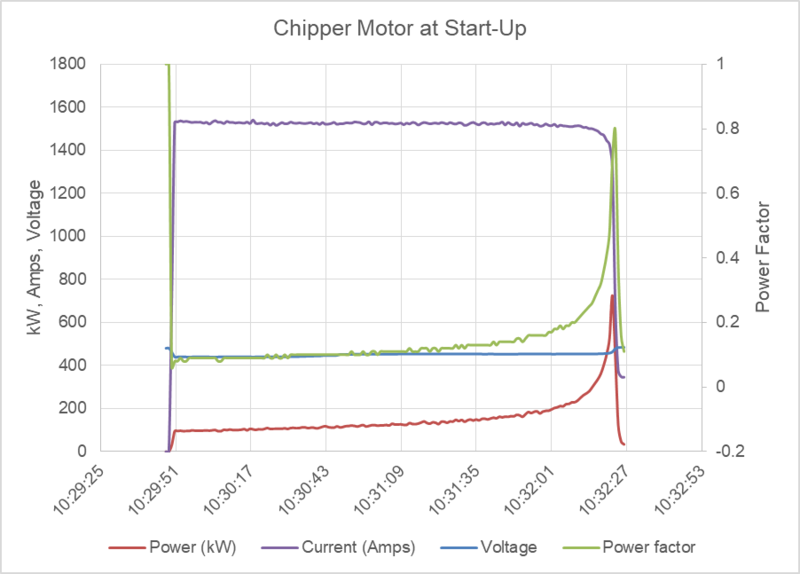 This is about 4 times the idle current of the motor, and almost 50% more than the average current while chipping. Inrush current lasts for approximately 2.5 minutes. However, notice that power (kW) spikes to 800 kW for less than a second at the end of the start-up period. To explain this, I recommend first reading our blog post on power factor. It may surprise you that the utility does not charge you for all of the Amps required to start up the motor. Some of the Amps contribute to the inductive load of starting the motor. This is called reactive power, which doesn’t contribute to any work done by the motor. A low power factor indicates a high ratio of reactive power. You can see in the figure above that power factor remains low (10% – 20%) for much of start-up. The utility only charges for real power, which does not include this reactive power, hence why real power (kW) in the figure above remains low while current (Amps) is high. For the last few seconds of start-up, power factor spikes, hence the spike in real power (kW). 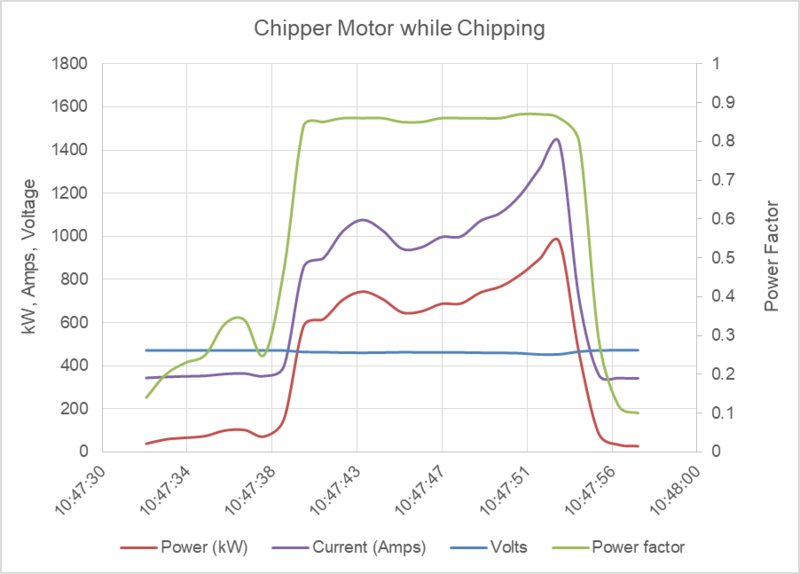 Real power is sustained between 600 kW and 1,000 kW (average of 715 kW) for the full chipping cycle of 13 seconds. (On another subject, it is apparent that this motor has been re-built to handle loads much larger than 800 hp). Approximately one log is chipped per minute. It should now be apparent that average power during typical chipping operation is not significantly affected by motor start-up. Thus, motor start-ups do not have a significant peak power or energy cost. In this case, and in the typical case in my experience, peak demand occurs during peak operation, not at motor start-ups. From a utility perspective, motor start-ups are a bigger deal. Utilities have to provide all of the Amps required for start-up, whether it contributes to real power or reactive power. If your facility’s average power factor is below a threshold, the utility may include a power factor charge on the bill. In my experience, this additional charge is insignificant compared to the energy charge. Final question: Does it cost more to start and stop a motor or to keep it idling? As we have demonstrated, motor start-ups do not have a significant energy cost. In idle, the motor consumes a small percentage of full load power. This motor consumes 28 kW when it’s running idle with no logs to chip. Say you could choose to turn off the motor during breaks, for a total of 2 hours per day, 5 days per week. This easy practice of turning off the motor would save $840 annually, assuming $0.06/kWh electricity rate. Note that the manufacturer’s recommended maximum motor starts per hour should be followed as a standard maintenance practice.